This a collection of knives I have been lucky enough to receive mostly as gifts. I just finished this display case to show them off. 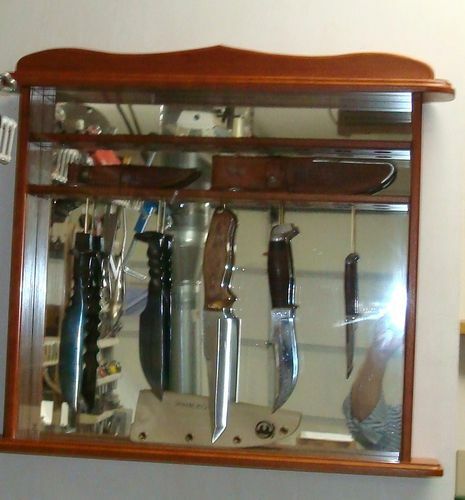 Some of these pictures almost look like double images that is due to the mirror backing in the case which allows for viewing both sides of the knives. The center knife I received in the just completed Lumber Jocks knife swap from David Kelley. Those scales are made from a cactus plant. There is a bunch of details about this knife which my pictures will not show. The sheath was also made by Dave and has my name on it. The two to the left are railroad spike knives. The one with the square head is a thread in spike and the other is a drive in. The fellow who gave them to me is a great friend and avid collector of many man things from guns to knives. The two Case knives and sheaths plus a matching hatchet were given to me for Christmas by my Mom and Dad a little over 65 years ago. They were carried a little but have never been sharpened. Sorry these pictures are so poor but I could not seem to get the lighting right. Anyway thanks for looking. Very nice case for a beautiful collection! Nice case for your collection, Vernon! And looks like there’s room for a couple more. Good planning! Wow! What a showcase for those beauties. Nice work. 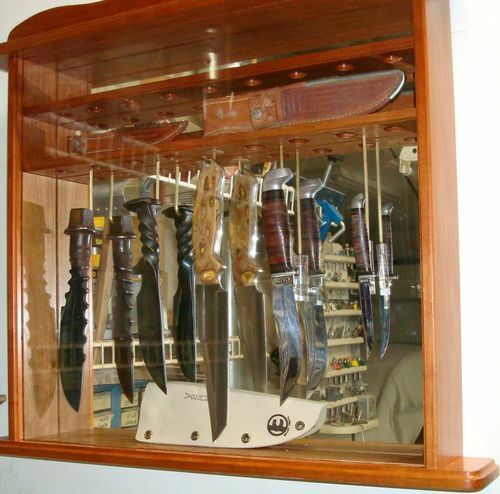 And here I thought you only display wood knives. LOL. Good job Vernon. The knives are great but your case makes them look even better. Beautiful collection in a beautiful case! Nicely done. I really like the use of a mirror. Well done Vernon. 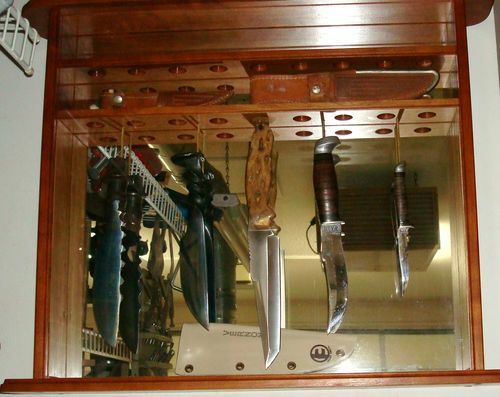 That’s a great display for your “special” knives. Very well done! What is actually holding the knives up? 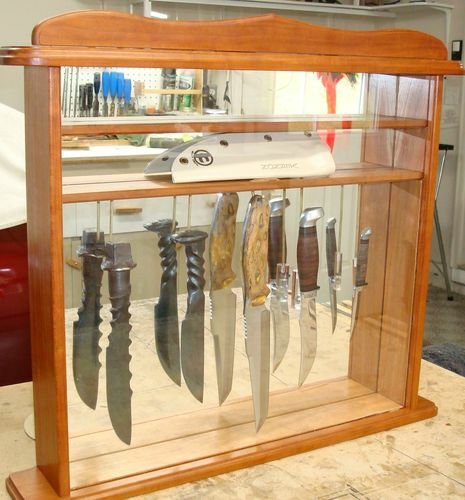 These are beautiful knife showcases and are done with a lot of fine quality and craftsmanship. The design work is so nice. Well hell Vernon, if you’re trying to flatter someone, it worked. Very good job on the case! Not sure mine deserves the center spot there but I’ll take it! I’m really pleased you like the knife buddy. Happy holidays! I thank all you my friends and buddys for the very nice comments. Yes Dave there is space for a few more. The knives are supported by 1/8” brass rods threaded on the ends going into the wood shelves. The two railroad spike knives just have a hole drilled into the top with a hook on the rod, center has a lanyard hole which hangs on a hook on the rod, The last two were more difficult. I also threaded the lower end of the rod and threaded it into a Plexiglas rod which was drilled in the side to accept rare earth magnets. These allow hanging the knives with no holes to damage the finish. Again thanks to you all and a big MERRY CHRISTMAS to you all.